VdmSound Quick & Easy is a tool to run Lucasarts adventure games in Windows NT4/2000/XP with full sound and music with the minimum of hassle. 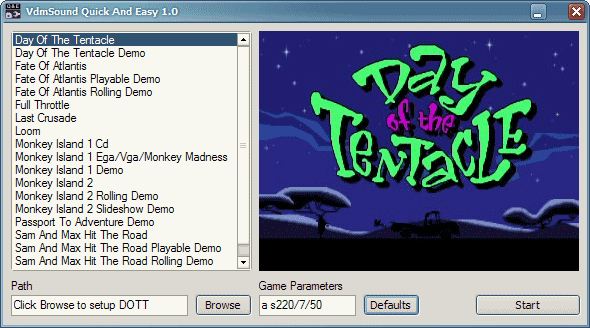 To do this it uses VdmSound – a dos sound emulator. Q+E runs the game through VdmSound with the optimum command line parameters to ensure correct sound, music and if present talkie. Unless you have a real need to run the games with the original interpreters you would be much better off using ScummVM Quick And Easy, since it has many additional features and ScummVM runs much better than the original interpreters.